A Stafford teenager got the surprise of his life when jazz singer Michael Buble invited him to perform live on stage. And under the spotlight, Sam Holyman's first few bars of Buble's popular hit Feeling Good were met with gasps of appreciation by the Canadian crooner. Not only that, spontaneous applause erupted from the 14,000 crowd at the National Indoor Arena in Birmingham. Michael Buble then joined Sam for a duet to finish off an unforgettable evening for the student. Sam's mum, Paula, had bought tickets to see Michael in concert as a treat for Sam's 15th birthday. During the gig, she made her way to the front and asked Michael if her son could sing. 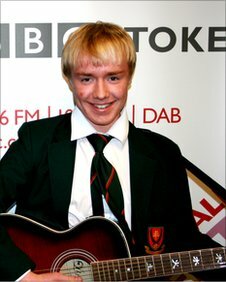 Sam told BBC Radio Stoke's Breakfast Show that he saw his mum walk up to the stage but he had no idea what she was up to. But sportingly, Michael then picked Sam out of the crowd and put a microphone in front of him. While most of us would probably freeze at this point, the year 10 pupil from Blessed William Howard High School in Stafford joined in with the opening lines to Feeling Good - one of Michael's best-loved live tracks. Sam brought the house down and Michael Buble responded instantly with the words "the guy can sing". The two of them then continued the song, which was originally written by Anthony Newley and Leslie Bricusse for the 1964 musical The Roar of the Greasepaintthe Smell of the Crowd, in the form of a duet. To round off the evening, Sam was invited back stage after the concert to have a chat and get his photo taken with Michael. You can see Sam perform with Michael in this Youtube clip . Feeling Good has been previously recorded by many artists including Nina Simone, Muse, The Pussycat Dolls and George Michael.